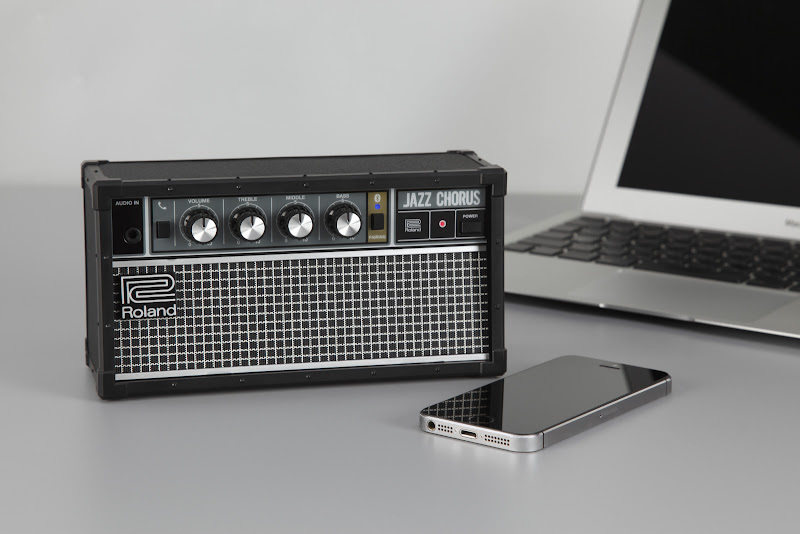 Roland is pleased to announce the JC-01 Bluetooth® Audio Speaker, a unique new addition to its renowned Jazz Chorus lineup. For the first time in the long-running series, the JC-01 steps outside the world of musical instrument amplification to provide ultra-clean stereo sound reproduction for smartphones, tablets and other Bluetooth wireless devices. With its cool “mini JC” appearance and portable design, the JC-01 is the perfect mobile companion for music lovers, guitar enthusiasts, and anyone who wants great sound on the go. Roland’s Jazz Chorus amp series is legendary in the guitar world as the benchmark in clean tone, and equally respected for reliable operation and lasting durability. True to the Jazz Chorus tradition, the JC-01 offers exceptionally clear and natural sound in a rugged design that will stand up to years of everyday mobile use. The integrated, rechargeable battery provides many hours of wireless operation for listening to music, podcasts and live audio streams played from mobile devices. Equipped with two custom speakers, the JC-01 produces a high-definition, stereo sound field with richness and transparency through the mid and high ranges. Thanks to the built-in passive radiator, the JC-01 delivers deep, powerful bass that belies the unit’s small size. A three-band EQ is also included, giving users a much finer range of tonal adjustment than available in typical Bluetooth speakers. The JC-01 includes some useful extra functions as well. Rather than a guitar input, the Audio In jack can be used to connect another audio device, enabling users to creatively mix wireless and wired sounds together. Also on board is a convenient speakerphone function that allows smartphone users to talk hands-free with a quick touch of a button. To learn more about the JC-01 Bluetooth Audio Speaker, visit www.rolandus.com/products/jc-01/.